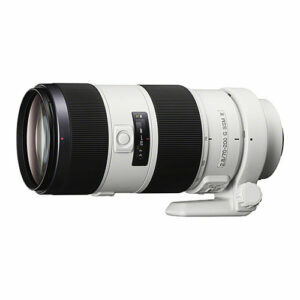 Lens Description: The newest addition to Sony’s A-mount family, this evolved ‘Mark 2’ version of the coveted 70-200mm F2.8 G Lens is an ideal choice for portraiture, sports and wildlife and more. This premier-quality telephoto zoom offers an extremely bright F2.8 maximum aperture for excellent light-gathering at all focal lengths. Now approx. 4x faster than the preceding model, super-quiet autofocus now offers improved AF tracking of moving subjects compared with its predecessor. Optical performance is further enhanced with addition of Sony’s proprietary Nano AR Coating that suppresses internal reflections for outstanding clarity contrast, from bright highlights to deepest blacks.